Last month, we showed you part of an AOSP commit that actually mentioned the Google Pixel 3 by name. Now, a report published today reveals a comment in another AOSP code commit that points to the release of two Pixel (2018) handsets this year. That is not surprising since we do expect a Pixel 3 and a Pixel 3 XL to be launched in the second half of 2018. The comment on the website mentions concurrency tests that need to be run on "Pixel 2018 & above devices." The Pixel 2 and Pixel 2 XL were unveiled and released last October, so the fact that there are still important AOSP tests to be run on the 2018 Pixels should not be a cause for alarm. Once the testing is complete, the 2018 models will be given their traditional fish codenames. 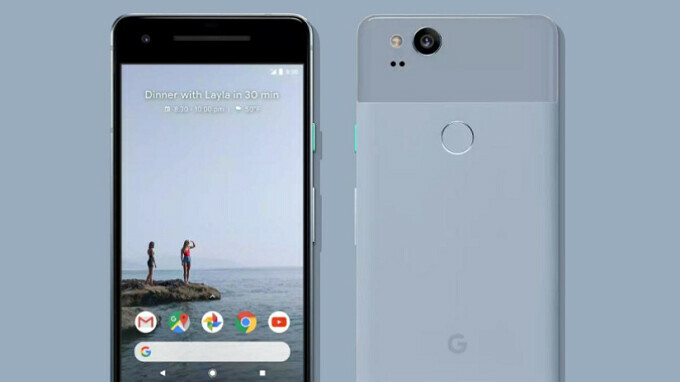 The Pixel 2, manufactured by HTC, was called "Walleye" while the LG built Pixel 2 XL was known as "Taimen." Last year, even before the Pixel 2 and Pixel 2 XL were introduced, there was speculation that LG will be the lone Pixel producer for the 2018 line. The Pixel handsets are known for their outstanding cameras and fast updates. Unfortunately, the Pixel 2 and Pixel 2 XL also had several issues including reports of burn-in on the Pixel 2 XL screen. Users also reported other problems with the same display, and microphone problems with the Pixel 2. Things were so bad just weeks after the phones launched, that a law firm sought out owners of the second-generation Pixel models in order to file a class action suit against Google, HTC and LG. Everything has apparently been straightened out since we've heard nary a peep from owners of either model over the last few months. Looking forward to what the pixel team does with the pixel 3 and 3 xl. just an another variation of the ugliest phone design known to man. And then they're gonna hold an event where their guys get all silly and think they're roasting apple but then nobody really cares about their obscure references and dumb jokes. There is one good thing though- the pixel 3 will be one of the 5 phones that will have android P within the next 12 months because waiting 2 years for an update is the android way. What about midrange pixel to be on par against iphone se 2,no leaks on that?hope by next 2 month leaks come in. My pixel 2 works flawlessly! No burn-in, screen or mic issues! Now I'm waiting for Pixel 3! Looking forward to PX3, it would be a good replacement for Nexus 5X. I just hope that Google release these next Pixel smartphones with much less issues than the previous models. I pray that Google doesn't hamstring the 2018 device by making it a Verizon exclusive. Ultra vast majority of US consumers simply must finance with their carrier. Ask HTC how their business has been after carrier support eroded.